Back before BIC lighters and matches, primitive men went on quests for fire! And today, not unlike ancient man, I embarked upon my own special quest, but this one was for neatness and better makeup organization. It took weeks of preparation! — okay, maybe not weeks. 🙂 The idea stemmed from a comment left by MBB reader Marisa (thanks, girl!) and the eyeliners and cream shadows I dealt with a couple of weeks ago. 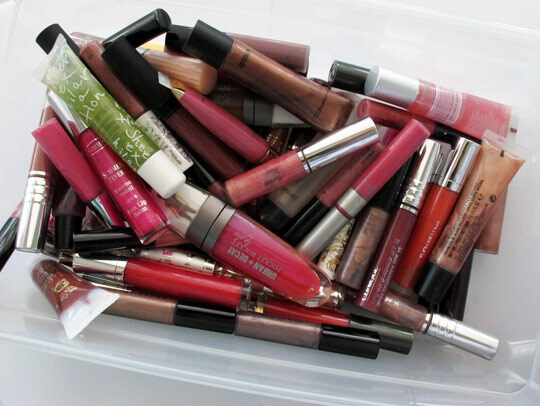 Before that, I’d resigned to let my lip products live lives of disarray, tossing them all into a clear plastic box. But that just wasn’t working. I was stressing out every time I had to pull it out to find something, like yesterday, when I spent an obnoxious amount of time looking for my tube of Lychee Luxe (I knew it was in there!). See, this is why I love craft stores: cheap and easy storage solutions. For this project I needed scissors, Scotch tape, one big box and a bunch of smaller empty boxes from lipsticks and gloss. Find the big box. 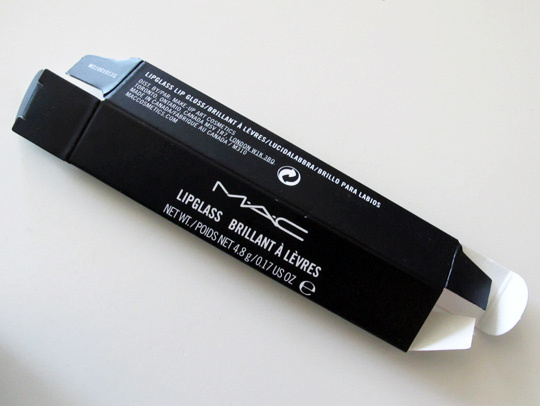 It should be deeper/taller than your longest lip product when you stand it up inside the box. I picked this pink one because not only does it fit my longest gloss, but it also has a lid, which makes it stackable. 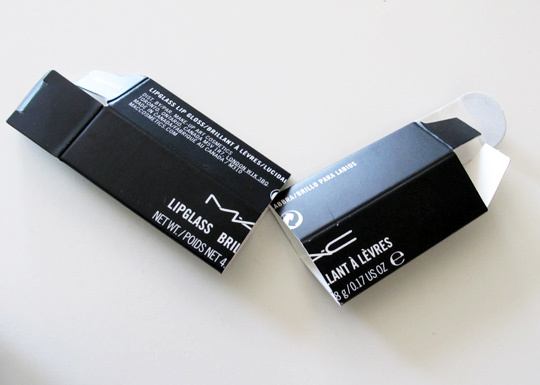 Flatten one of your empty lipstick/lipgloss boxes, and cut it through the middle to split it in half. Tape both halves together, side by side. Do that a zillion times (or enough times, whichever comes first). Once you have enough split boxes to hold all of your lip products, start standing ’em up in the bigger box. Fill each of them with one of your lipsticks or gloss, label side up so you can identify the product without having to dig. Take your makeup organizing to the next level with this helpful reference tool. Swatch and label each row of colors from your big box on a piece of paper; so the swatches don’t smear, cover them with a piece of clear tape. 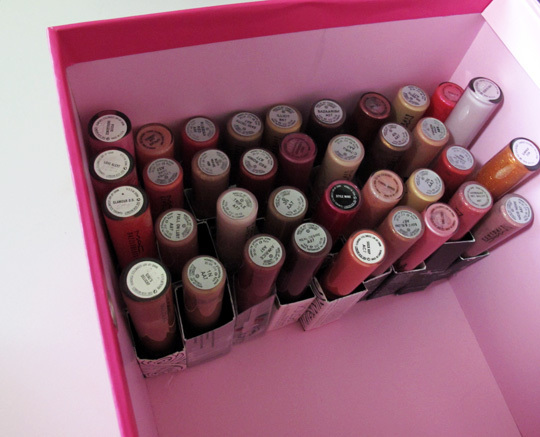 How do you organize your lip products? Got any tricks up your sleeve? Previous Post: Tuesday Beauty Tips: Don’t Stop Believing! .-= candace’s last blog post… stuffed zucchini. =-. .-= Karen B’s last blog post… Make-Up, Day and Night =-. i love your idea! not only is it more organized, but you’re also re-using the old packaging 🙂 i love finding new ways to organize using otherwise worthless stuff. thanks!! now if only i had enough lipsticks/glosses to actually make it look decent! haha maybe i will make use of a smaller box 🙂 love your organizing tips! .-= Agnes’s last blog post… New Love â™¥ Green Nail Polish + Chanel Jade dupe? =-. Oh that is ingenious Karen. I love that you reused and recycled the old lippie boxes to use as stands. Why didn’t I think of that? .-= amy’s last blog post… A â€œSecretâ€ Sale at Pacifica Perfumes for Bella Koola Readers =-. .-= Rachel’s last blog post… 4 MINUTE MAKEUP =-. .-= Joey Chong’s last blog post… Look InÂ SmokyÂ Tendre =-. This is seriously brilliant. But I threw away all of the boxes, drat! I also like the idea of keeping swatches with your stash. .-= Jess’s last blog post… Price Report for Watsons Warehouse sale 2010 =-. This is really an amazing idea! I should consider this as I have been neglecting my lippies a lot lately as they are just everywhere…..in the drawers, on the dresser, and it just makes me lazy to search for them one-by-one each time I want to use a certain color. This might make me use my lippies more…i mean, a variety of them! And I like the indexing of the shades. .-= Vonvon’s last blog post… EOTD/FOTD: Gold & Burgundy – From CLEO-Lancome Makeover =-. .-= Radhika’s last blog post… Lush Ocean Salt Face and Body Scrub =-. .-= meimei’s last blog post… If At First You Don’t Succeed… =-. .-= Paris B’s last blog post… Guerlain Meteorites Perles Loose Pearls Illuminating Powder Teint Rose â€“ Love the new packaging dahling! =-. 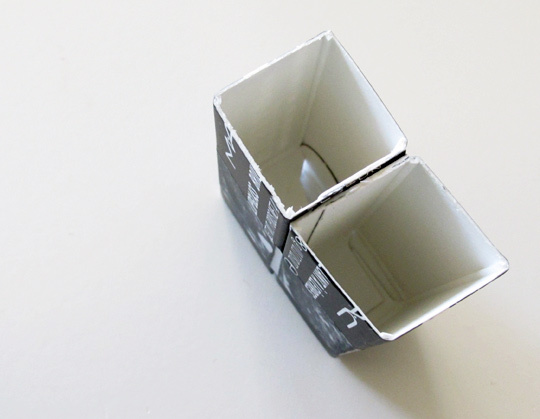 if you’ve thrown out your boxes, these from the container store will work! i use the little one in the very front for bobbie pins, and if you take the cap off it would fit lipsticks/glosses perfectly. AND they come in a ton of colors. .-= mint’s last blog post… Portable Handbag Butler/Hook =-. Awesome tip! I might do this for my lippies but using a slightly shorter box (maybe an index or recipe card box. I always have to root thru my little plastic bin for the lippies I want. Thank you! This is a great idea!! Your organization before this looks just like mine. All my lipsticks and glosses are thrown together in a bag. I don’t save the boxes they come in though, so I’ll have to find something else. Such a cute idea! Too bad I don’t have any lippie boxes hanging around. Mine are actually in a similar fashion – stuck upside down in a small box. I just crammed so many in there that they kinda stand up on their own. Not as nice as your solution with the little compartments for each gloss! what a great idea! thanks Karen! .-= Hobbit84’s last blog post… Clarins Lotion Eclat du Jour =-. This is such a fantastic and ingenious idea! Everything looks so organized. I wish I hadn’t thown away most of those lippie boxes but I now I know what to do with them next time I buy something new. Thanks for sharing. .-= gio’s last blog post… Second Blog Anniversary + Giveaway! =-. what a cute idea – makes me wish i would have held onto my old lipstick boxes! HAPPY BIRTHDAY, KAREN!!!!!!! Hope you have a great day 🙂 P.S. This is such a great idea! Your labor was not in vain! haha!! That’s awesome. I love organizational stuff like this! Waah, I threw all of my boxes away except for the LE ones, which I don’t want to cut up. 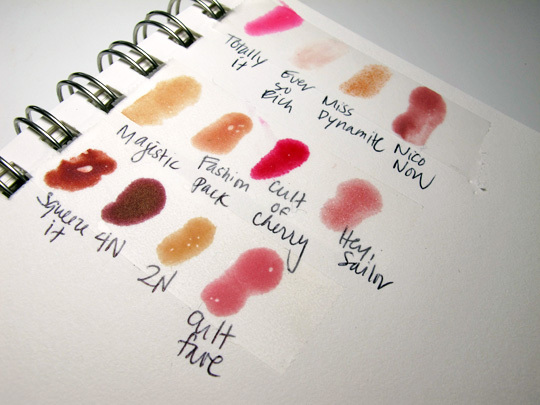 But I love the idea of swatching them all in a notebook. Great Idea! Usually makeup storage tips are something along the lines of “buy this thing from this store” so I love that you came up with an actual diy tip. Only problem is I’m starting to suspect that storing lip glosses upside down or on their sides contributes to them starting to leak….on the other hand I think I take MUCH longer than the average person to finish a gloss so maybe I’m one of the few who has even encountered the leaking gloss tube problem. .-= knownever’s last blog post… Is Lush in danger? : a One Bath and Body review =-. Gasp, My Capricorn, makeup lovin’ brain is very happy with this post! Oh, the hours I could spend swatching and organizing. .-= Stef’s last blog post… e.l.f. Studio Candid Coral Blush and brush =-. What a great idea!!! I love the creativity! .-= Lindsay’s last blog post… Giveaway Sneaky Peaky =-. That’s such a fantastic idea! And it looks so cute, too! But I threw away all of my empty gloss boxes…I will have to start saving them from now on. .-= Deb’s last blog post… Stride Shift Flavor Changing Gum =-. but your method is much easier. I spent about 3 hours to make a 40 spaces storage box!! Sadly I dontÂ´t keep my lipstick/lipgloss boxes. When I buy a new one I cut the name in the box and put it in a jar so when IÂ´m uninspired I randomly pick one name of the jar and make a look around it. 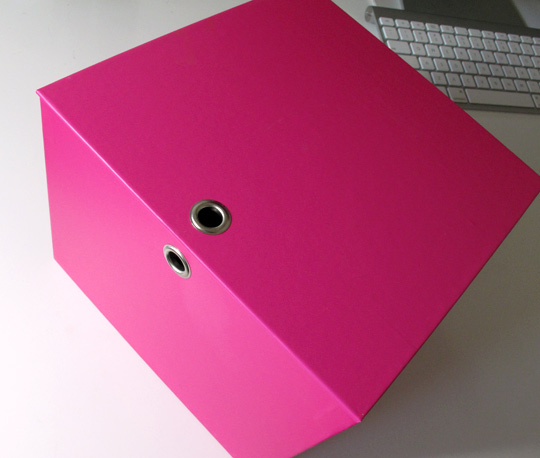 This website actually sells a box designed for lipsticks! And, it’s only $12.95 and holds 50 lipsticks. I think I found this through another blog… can’t remember which one though. 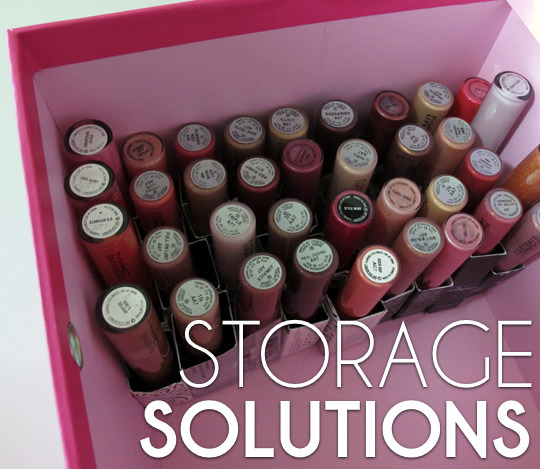 ohhhhhhhh, i love ur makeup storage posts….love the ideas you share….you rock! anyways, i looove this idea im such an organizing junkie i always look for ways to organize my makeup, closet, etc. What I usually do is just throw all my lipsticks and glosses into a box, but like u said sometimes its not fun to dig around and this is suuuch a great idea. i cant wait to start on it..i already have the perfect box in mind but unfortunately i havent kept my gloss boxes so ill have to find another way lol thanks for the tip! .-= Aniela’s last blog post… 2010 MTV Movie Awards Best and Worst Dressed =-. SO COOL! I just have all my glosses and lipsticks a makeup bag, NOT way to organize them, lol. .-= Sarah’s last blog post… =-. My my my are you super woman in disguise?! This is great. Happy Birthday Gemi! Holy moly, this post is relevant. My lipsticks are the very last thing I need to get organized. I was having a hard time figuring out what to do, but this was really helpful. Thanks, Karen! .-= Trisha’s last blog post… Beauty Review: Avon ANEW Reversalist Day Renewal Cream SPF 25 =-. 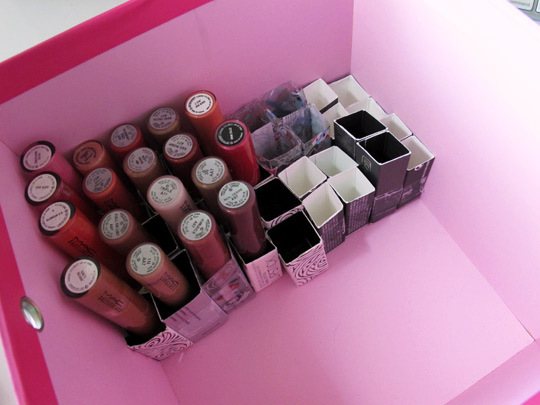 It’s too bad that I throw out lipgloss/lipstick boxes immediately once I get them home~ I really love this idea. I am embarrassed to admit I have more lipstick than that. I have them broken down into colors. This is a great idea however, I don’t have any empties to use. I keep mine in clear plastic containers. .-= marisol’s last blog post… Abandonment issues =-. And Happy Birthday Karen 🙂 Hope you have a good one! This is the best idea I’ve seen in years. Thank you. .-= BrooklynShoeBabe’s last blog post… A Creamy Review =-. this is fa bu lous!!!! and the swatches!!! greaaat idea!!! .-= laetitia's last blog post… Giveaway…Again! =-. Brilliant! Such a great idea! .-= Jackie’s last blog post… A Liquid Highlighter Comparison =-. Egads.. my “organization” looks suspiciously like the first pic. Thus far I’ve resorted to using one of those big ole plastic Tupperware filing cabinet things.. I stick all of my lip products in the top draw but honestly, it’s a total mess. I did something similar like this with my nail polishes.. brilliant idea! .-= Marmar’s last blog post… Ride the beachy boho wave =-. yay!!!! I’m so excited my comment inspired you to do this! it came out so well! you can also even skip the outer box and just tape together the lipstick boxes, that way i can make the organizer fit whatever drawer i want. to everyone who is worried because they threw out their boxes: i had the same issue, but luckily, because each new product you buy will provide a compartment for two items, it starts to catch up with the number you have (provided you are a makeup addict such as myself). This is a really cute & crafty idea! I’m definitely gonna take this into consideration once I start making more makeup purchases! .-= Jaida’s last blog post… My to-do…well MUST-do list =-. I love this idea I created my own storage box out of an old box the a letter set came with and created the reference chart on the side of the box so I know what type im looking for. Thanks you have inspired me! that chart is such a fab idea!!! and its gives u such a self-fullfilling joy~love it!! LOL, it’s also pretty useful! I refer to mine all the time. It’s much easier than having to go through the individual tubes. Love this idea, especially the swatch book! It totally takes lip gloss organizing to the next OCD level, LOL!